My excuse for being late was all the loyal fans congregating around Graceland for days after Elvis died. Lots of them held tickets to the concert Elvis did not live to give. Many of Elvis's fans never even tried to get a refund for their tickets, and I guess maybe those tickets are worth something now. I tell you, folks were wandering around the area of the boulevard where Elvis's mansion is bawling their eyes out and stopping traffic. One man must have been as inconvenienced by our out-of-town company as I was, because he just plowed into a crowd of 'em! This was a tragic accident with injuries, but I can understand how it happened. Traffic moved so very slow that it was easy to get bored and distracted. I actually read while I inched along. That August I really caught hell getting back and forth home -- even at 3:00 a.m. when I left work. The traffic was incredibly, steadily congested within five miles of Graceland with a stream of cars inching to and from the mansion with license plates from all over the country. Folks were actually sleeping on the grassy slope outside Graceland's fancy gates, having found no room at the inn, so to speak. I was too naive to consider what my efficiency might have been worth as a one-week rental. Boy, the opportunities of youth that we wish we had grasped! Hindsight. Anyhow, I had to park up to three miles from my apartment and walk through crowds of mourners crying and consoling each other. I also felt bad about Elvis's death, and one evening I stopped and spent a some time with his other fans, having parked blocks away again. It was like a wake out there, and I met people from all over the U.S. and abroad. One family I met was from the UK. I'm glad I stopped and spent time with them. It turned out ot be a nice way to say goodbye to the legend that was Elvis. Elvis Presley was a gifted vocalist with a colorful life story. I was always impressed with the tale about Elvis buying a Cadillac for a black lady he did not even know . Now, I don't know if the tale is true, but the story goes that one day Elvis was cruising about town in his famous pink Caddy, and he happened to pass by a Cadillac dealership in town where he noticed a black woman ogling the big, luxurious automobiles through the glass of the showroom floor. Elvis reportedly stopped his Caddy and walked right into that dealership and bought the lady a car! Truth or fiction, I don't know. Elvis was some singer and dancer, alright. I used to watch his movies on the 24" black and white television set my dad proudly purchased when I was a pre-schooler. We were probably the first black family on our street to own a TV, and we had lots of problems with too much company for years afterward. Yep, white people lived on my street, too. We lived about 40 miles from Memphis in a very small town. The fact is that complete segregation was never feasible in small towns in the South due to space restrictions. I recently met some people from New York who told me that while growing up in Harlem, months would sometimes pass without their seeing any Caucasians. My friend and co-worker at a firm in Decatur was from Washington State. She told me that she was 18 years old before she went on her senior trip to Seattle and saw her first black person. At the time, I found these accounts hard to believe. In our little town, everyone knew everyone else, including most of their personal business and their ancestry. Half the town were cousins to each other. Despite Jim Crow and other silliness, there was a certain closeness, for lack of a better word, among the town's residents. Maybe you would have to be from a small Southern town to really understand what I mean. Do you think that for real fear and hatred to prevail in people's minds regarding another group of people, a certain amount of separatism is necessary? Anyway, back to Elvis. I liked Elvis's voice and have some of his music - a Christmas CD and another with Elvis's greatest hits, and I seldom miss a PBS's presentation of Elvis in concert. But I promise you, by the end of the week he died and caused the worse traffic jam in Memphis history, if Elvis were not already dead I might have strangled him myself. My schedule was tight in the 70's, you see. I only had a few hours to snooze after school each day before reporting to work at 6 o'clock in the evening. So, besides being a tragic, unnecessary waste, Elvis's death was also a serious impediment to my rest. It was no fun having to park and walk two miles to my apartment from a shopping center blocks away. I had to look for alternate routes home. I learned some back roads nearby that I never knew existed and might never have known, if only Elvis had said 'no' to drugs (see notes below). Unfortunately, most of the back streets I tried were just circles and dead ends. One afternoon I was determined to get all the way home in my little red VW Beetle, a semi-automatic cutie! I was hot and tired, had no air conditioning in the bug, and I only had three hours before reporting to work. Slow traffic was making me miserable, so I tried once again to find another route home and avoid the congestion on Elvis Presley. The houses were quite lovely on the street I found myself traveling that day, with beautifully manicured lawns. I had plenty of time to admire the homes, you see, because it took about five minutes for me to pass each one. Yes, apparently the out-of-town mourners had taken over that street, too. Cars were double parked on both sides of the street, and I found myself moving very slowly toward a cross street where I hoped to finally get free! Fortunately, there was a small gap between two cars parked on my right, because coming toward me was a big Lincoln Continental, and it just kept on coming although there was barely room enough for my bug to navigate the narrow passage between the double parked cars. I had to quickly back into the parking space to make room the Lincoln. Do you want to know how really hurt Elvis's fans were by his untimely death? Well, let me share with you what I saw that day. As the driver of the Lincoln inched toward me, I noticed he was scrapping his beautiful car on both sides as he slowly rolled down the street. Moreover, he was also scratching the sides of each and every mid-sized or large car that he passed! (In case one of the cars was yours, no, I did not get his license number, but it was definitely an out-of-state tag.) Thank God for my VW's compact size! The driver was a heavyset, middle-aged guy, accompanied by folks who were likely his wife and two daughters. Everyone in the car was crying as they scrapped along. Elvis dominated the headlines and conversation around Memphis and the nation for a long time after his untimely death. Even before Elvis's burial, I heard someone voice doubt about him really being dead. Elvis was so large in his fan's eyes that some could not conceive of his dying. 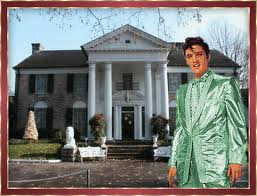 Did you know someone tried to steal Elvis's body, which prompted the decision to lay Elvis to rest at Graceland? I should have bought several copies of the Commercial Appeal. They might have historical value today. Goodbye, Elvis. We still miss you. Rest in peace. A therapist from Greystone Park Psychiatric Hospital in New Jersey advanced the thesis that Elvis suffered bipolar disorder, which is a more technical name for manic depression, and that Elvis' substance abuse, eating disorders, and chronic depression should be placed in the larger context of a personality disorder. We think that this will shed new light on the issue of Elvis' death and will take it out of the narrow context of suspected overdose and addiction to the larger and more fundamental issues of Elvis' childhood, family history, the cultural influences of the times in which he lived, and other factors which contributed to a possible personality disorder. Elvis is an American icon. There are few Americans who cannot sing along with Elvis' many top tunes. This article serves to remind Americans that we share a common heritage which is as relevant to our identities as our individual cultures based on ancestral origins in pre-colonized America, Africa, Europe, or Asia. I believe that prejudice can only be sustained and fear and hatred survive and grow in a separatist environment. Social integration dissolves myths about people of other races, religions, and ethnicities. Prejudice must be completely eradicated, and this can happen as we begin to focus more on our common heritage rather than divisiveness. It is hard to imagine, but Elvis would have been 77 years old now. We could have had years more to enjoy his melodic voice and watch women swoon at his gyrations on stage [perhaps if only he had sought help for depression and drug use] . . . But alas, this was not to be, despite the many false sightings that occurred for years after Elvis was gone. In 2009, Rep. Eddie Johnson (D-TX) introduced legislation to resume Medicaid insurance to cover the cost of inpatient psychiatric treatment for acute mental patients who had a crisis or those who require long-term commitment. Unfortunately, the bill (H.R.619) did not make it out of U.S. congressional committees. In fact, because mainstream news did not cover the bill, most Americans did not know we had before Congress an opportunity to decriminalize mental illness. The bill should be re-introduced in the U.S. Congress, and everybody should HELP to give Assistance to the Incarcerated Mentally Ill. Move mental illness back to the health care system and away from the prison system. Acute mental patients who require containment should be hospital inpatients, not prison inmates. Continue reading my human rights advocacy articles at NowPublic.com. See a video of Elvis's funeral and access at the link below, and while at NowPublic.com, see more of Mary Neal's human rights articles by clicking on the icon of the two dogs. HELP REDUCE THE NUMBER OF AMERICANS WITH MENTAL ILLNESS WHO ARE DOING "THE JAILHOUSE ROCK." SEE ELVIS SING "JAILHOUSE ROCK" IN CONCERT ON YOUTUBE AT http://youtu.be/tpzV_0l5ILI AND AT THE EMBEDDED VIDEO BELOW. Great musicians, artists, scientists, and many plain Janes are currently incarcerated for behavior that arose from having a common, treatable health condition. Nonviolent mentally ill inmates should be released to community care and mandated to join an Assisted Outpatient Treatment (AOT) Program. Under an AOT, they would receive subsistence assistance if they qualify financially, plus mandatory psychiatric treatment. Providing for acute mental patients' basic needs and ongoing treatment upon release from correctional institutions and mental hospitals would get mentally ill people out of the revolving door to our jails and prisons and reduce homelessness and re-hospitalization by up to 85%, as proved by New York patients who were AOT participants. It would also increase community safety, save money currently budgeted for prisons and jails, restore families, and deliver many people to back to wholesome living. The United States Department of Justice certified AOT programs last year, and a number of states use them. HELP REDUCE THE NUMBER OF AMERICANS WITH MENTAL ILLNESS WHO ARE DOING "THE JAILHOUSE ROCK." SEE ELVIS SING "JAILHOUSE ROCK" IN CONCERT ON YOUTUBE AT http://youtu.be/tpzV_0l5ILI AND THIS ARTICLE. The photo on my profile is of my brother, Larry Neal, a handicapped American who was secretly arrested and returned to his family as a naked corpse after 18 days with records and accountability denied. That led to my becoming "America's Most Censored: Mary Neal." See this link http://goo.gl/aELp3 - I founded and direct Assistance to the Incarcerated Mentally Ill ("AIMI"), advocating for 1.25 million inmates who are wrongly and cruelly imprisoned rather than treated for their mental dysfunctions. I love God and the IDEA of America - a melting pot. Many hard lumps remain in the custard today. AIMI members work to have civil and human rights applied to all, including the mentally ill. We oppose wrongful convictions, prison profiteering, excessive sentencing, police brutality, capital punishment, and inequities in application of the law due to racial and economic disparities. We also oppose crime and recognize crime as being violations against human rights and property rights. Imprisonment is often warranted, but never brutality, torture, or death. We advocate love. The need is for America to "be true to what she said on paper" (MLK). AND AT THE EMBEDDED VIDEO BELOW.